Economic development and the environment are presumed to be in conflict, but the latter part of the twentieth century experienced a series of economic changes that increasingly questioned this view. Economic activity became more footloose and the ability to attract productive labor became a prominent regional development concern. Consequently, environmental amenities began to have a larger role in determining the patterns of regional growth and development, and subsequently moved to the forefront of current regional economic development thought and practice. Environmental amenities provide non-pecuniary benefits to area residents, and induce in-migration flows to regions that possess high levels of environmental amenities. The attraction is particularly strong for those individuals with higher incomes and wealth. The combined forces of increased demand for environmental amenities and increased spatial flexibility of production has brought environmental amenities to the forefront of current regional economic development thought and practice. Regional economic development policy needs to consider the tradeoffs of attracting firms or people, which requires an understanding of the role the environment plays directly or indirectly in attracting firms and households. 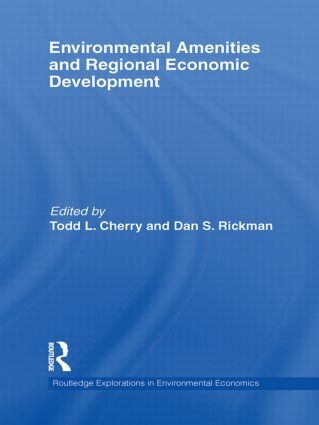 This book presents key papers that explore the role of the natural environment in regional economic development. The papers contain critical insights and information for both researchers and practitioners interested in the nexus between environmental amenities and regional economic growth and development. The book covers varied dimensions of this issue, including: the relative importance of amenities in recent variation in regional growth; the role of local infrastructure in promoting amenity-led development; socio-economic distribution concerns and sustainability of amenity-based growth; and the effects of local environmentally protected areas on other economic activities. This book will be of most value to practitioners and academics, specifically related to the areas of environmental economics, regional economic development, local and regional planning, public administration and public policy. Population growth in high-amenity rural areas: Does it bring socioeconomic benefits for long-term residents?